Mum gets scared wearing VR headset and grabs wrong end of dog! The poor pup didn't have a clue what was going on! If you’ve ever tried out a VR headset, you’ll know it’s a pretty strange experience first time around. 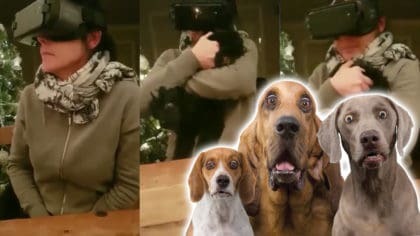 This mum found the whole thing a bit scary and reached for the family dog for a bit of comfort… but with the VR headset covering her eyes, mum couldn’t see that she’d picked up the dog by the wrong end! So instead of cuddling the dog’s head – she was actually cuddling the dog’s bum!